It is impossible to describe how lonely it is after you are afflicted with a rare disorder . Every person that wants to know your story requires a detailed explanation worthy of a medical professional. People that did not know better treated me like I was contagious, hiding their pregnant bellies and staying away from me as if HELLP syndrome were an airborne illness. With every “Oh! I have never heard of that” a feeling of dread and isolation sweeps over you. You are cast out, abnormal and alone. It would take three years for me to meet another mother that had experienced HELLP. And another three years after that for me to find the Preeclampsia Foundation of Canada and all the work towards finding a cure for Preeclampsia and HELLP syndrome. I have participated in two promise walks, arm in arm and in solidarity with other survivors, loved ones and those that mourn for the death this syndrome causes. It is a magical moment to know you may not be quite so alone, which was a driving factor for me in writing the book. I came home from the hospital two weeks after she died and put HELLP syndrome in Amazon and nothing came up. Community matters. Knowing that others are with you in the fight matters. 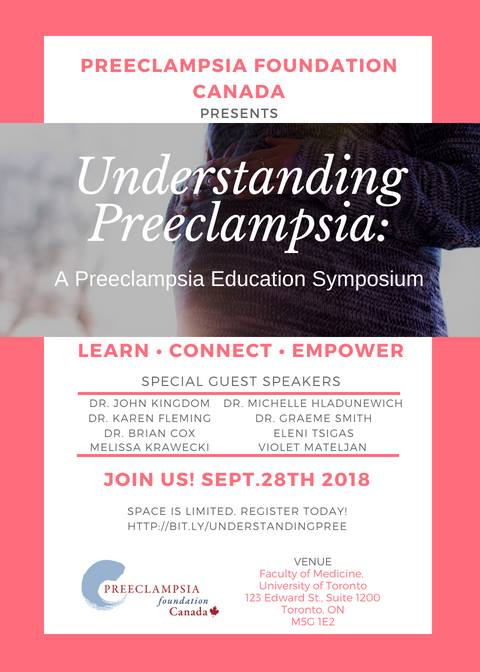 On September 28th I am honoured to speak at the Preeclampsia Foundation of Canada Conference. Please consider signing up today and if not, donate to find a cure.